IBMAbstract: An introductory walk-through for implementing data science with z/OS using Python and the Anaconda Package Manager. The walk-through will focus on using mathematical libraries in Python, highlighting techniques used by the data-scientist, and showing the value of open source software. Its goal is to highlight the tools of the trade and give you a starting ground for releasing Python on your system. About the Speaker: Joe Bostian has spent his career at IBM enabling, porting, and promoting the use of middleware and open source software on IBM Z. He is a data science architect and a technical lead for the IBM Open Data Analytics team. He has a BS in computer science from Purdue University and an MS in computer science from Rensselaer. Abstract: You want to "modernize"" your batch applications. You want to reduce costs by running the batch workload on zIIP processors. You want to exploit Java Batch support in WebSphere Liberty. Come find out about how the open standard for Java Batch (JSR-352) can meet your application programmer's needs while integrating a Java Batch workload into your existing batch infrastructure. About the Speaker: David Follis has been with IBM for almost 30 years and has been a member of the IBM WebSphere Application Server development team for 20 years. He is the runtime architect for WAS on z/OS and is the lead architect for IBM WebSphere Java Batch. Abstract: The one takeaway from encryption is that configuration is confusing, has a big learning curve and zFS has significant differences and considerations over BSAM/VSAM datasets. This presentation focuses solely on zFS encryption, both from a DFSMS/ICSF view and also the specific zFS view including: the zFS portion of configuration, BPX parmlib mounts, ICSF availability, migration of existing data sets to encrypted state, and backing out encryption. About the Speaker: Vivian Morabito is a function tester on the zFS squad at IBM Poughkeepsie, where she also serves as the squad iteration manager. Abstract: The z/OS system trace table is the "black box" of the system that z/OS debugging experts turn to when analyzing a problem. Have you ever wished you could read it more fluently? In this session, John Shebey, a seasoned member of the z/OS level 2 team, discusses practical examples, and useful tips and tricks in extracting key information out of the z/OS system trace (IP SYSTRACE) to debug problems. About the Speaker: John Shebey is a Senior Software Engineer at IBM Poughkeepsie, where he leads the z/OS UNIX Level 2 Support team. John has been with IBM for 20 years and is the z/OS Service Rep for SHARE. He holds a BS degree in Mathematics from Virginia Tech. Registration: Registration is required . Please RSVP to markan@us.ibm.com as soon as is possible if you are thinking of attending, but no later than noon ET on Tuesday, 17 April. 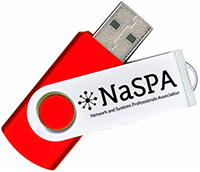 The meeting is open to non-NaSPA members and is free. Please pass this invitation on to your colleagues!